A blog post by Program Manager Rachel Cylus. To read more posts from Rachel, click here. 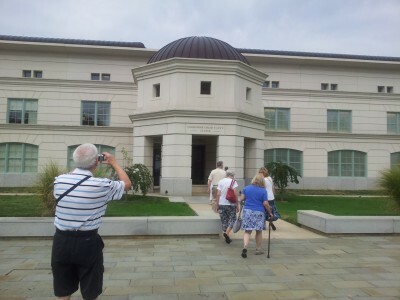 This year’s Salon Series – a three part summer partnership between the Jewish Museum of Maryland and the Myerberg Senior Center – ended with a bus trip to the Jewish Chapel at the Naval Academy in Annapolis, Maryland. 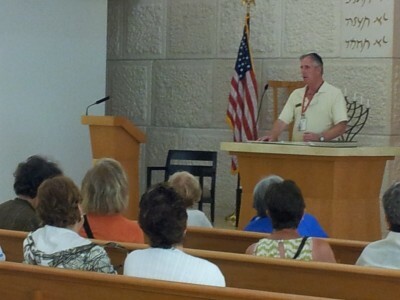 We were shown around by our docent, David Hoffberger, and the current Jewish Chaplain, Rabbi Joshua Sherwin. The Jewish Chapel at the Naval Academy is called the Uriah P. Levy Chapel, named for America’s first Jewish Commodore. Uriah P. Levy was born in Philadelphia in 1792 to a family with German and Portuguese origins. At the age of ten he left home and went to sea, returning at age 12 to prepare for his Bar Mitzvah. He was later an apprentice to a sailor. When the war of 1812 broke out, Levy volunteered, and due to his years of experience at sea, Levy was able to rise immediately to the position of commodore (note: the US Navy no longer has the position of commodore. The equivalent today is an admiral). Levy eventually attained the rank of captain. He was known for his stance opposing corporal punishment and was outspoken about banning flogging from naval punishment. After refusing to punish a young sailor using flogging, Levy was court-martialed and dismissed from service. The decision was later overturned by President Tyler. Levy was proud of his Jewish heritage and addressed issues of anti-Jewish sentiment that he saw taking place in the Navy at the time. Levy had a lifelong respect for Thomas Jefferson, who he considered sympathetic to issues of religious tolerance. Levy purchased Jefferson’s estate, Monticello, and he and his family maintained the site until the 1920s (though Levy himself died in 1862). Levy also commissioned a statue of Jefferson which stands in the rotunda in the U.S. Capitol. Although the Commodore Uriah P. Levy Chapel was built in 2005, Jewish students have attended the academy since its early days. Until 1972 it was mandated that students attend a weekly worship service on Sundays. Jewish students and other students whose religious affiliations did not align with the chapels available on campus, were still required to attend. In 1937 Jewish students persuaded the academy to allow them to attend a Jewish service at Kneseth Israel Synagogue, the only congregation in Annapolis, if that congregation would agree to have a special service on Sundays. The Naval Academy permitted them to begin attending these special services in 1938, and as one of our bus trip attendees and JMM volunteers, Bobbie Horwitz, recalled from her childhood in Annapolis, attending the special service on Sundays and preparing food for the Naval Academy students was a big deal for the small community. In keeping with the traditions of the Naval Academy, the group of students called themselves the “Jewish Church Party,” although they were eventually renamed the Jewish Midshipmen’s Club. Kneseth Israel eventually moved out of the Annapolis city center, making it too far for the students to walk on Sundays, and even though compulsory attendance of religious services came to an end, Jewish students continued to look for a way to have services and social events. 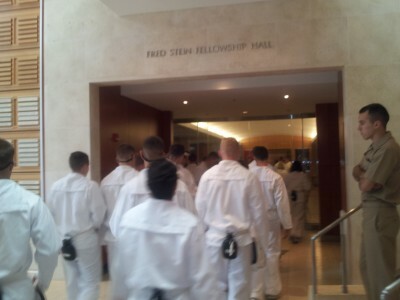 Over the next few decades the Jewish Midshipmen’s Club (JMC) made us of storage spaces and the All Faiths Chapel. In 1994 the Friends of the Jewish Chapel was founded to give support to the JMC , and in 1999 they began to plan and raise funds for the Uriah P. Levy Chapel. It was dedicated in September 2005 and has provided a space for services, programs, and small exhibits related. The Chapel looks like a boat! 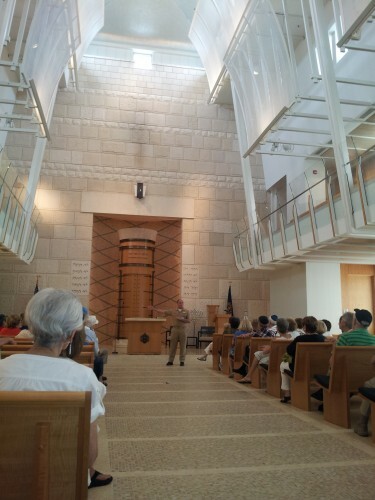 During our visit over fifty attendees from the JMM and the Myerberg Center visited the chapel, which is built to look like the inside of a ship. The aisle leading up to the bima is an optical illusion to look as though one is ascending. As a special treat at the end of our visit, Jewish Chaplain, Rabbi Joshua Sherwin spoke to our group about his work at the Naval Academy. Chaplains serve at a post for three years, and he recently became the 10th Jewish Chaplain to serve at the Naval Academy. Only eight rabbis are active in the Naval Academy, Marines and Coast Guard. Jewish and other minority groups are what is known as LDHD – Low Density, High Demand, which means that at any base in the world there is likely to be a at least one Jewish person on active duty. So, the chaplains take turns visiting different parts of the world at holidays. Rabbi Sherwin has been to Afghanistan several times for this reason. 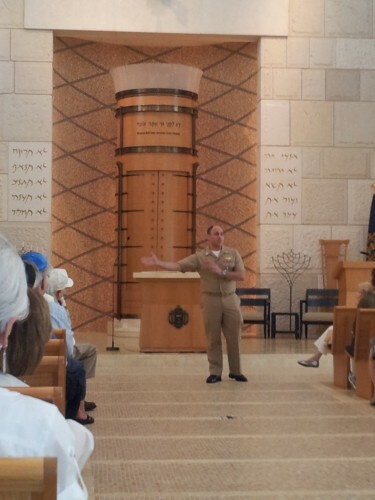 In his work at the Naval Academy he, like all chaplains, serves all students, not just Jewish students. The Jewish Chapel also serves all students, not just Jewish students. The balcony of the chapel is always open so that students can come spend some quiet time there whenever they want. Look for more bus trips with the JMM coming soon!